Pedestrians are the most vulnerable road users in South Africa and special efforts are being made to reduce the number of incidents involving people who walk next to the national roads. Some 12.4 million pedestrians under the age of 24 walk to school every day and are especially at risk, unless steps are taken to curb the high rate of vehicle crashes involving pedestrians. About a third of all schools in the country are located within 5km on either side of the 22 203km of national road network managed by SANRAL. The agency’s aim is to educate the 6.3 million affected learners with appropriate educational learning opportunities. This scientifically developed material will create the awareness required to influence attitudes that will result in safer road-user behaviour. The roads agency is working closely with education authorities and the primary objective is to “train the trainers” – getting the information to teachers and mobilising their support to mpart the correct messages to their learners. Children require different skills and information depending on their age and experience. SANRAL has developed comprehensive educational materials that are appropriate for the different teaching stages. The material is incorporated into regular subjects at school – whether it is life skills or maths – and the educators have access to flip cards, posters and other teaching aids. SANRAL’s initiative has already reached 1 940 schools and more than 14 000 teachers have received training and learning materials. The programme will continue to expand to benefit an increasing number of learners living in close proximity to the major highways. The behavioural research is informing the content development based on the latest available research. “Our primary goal is that this awareness must lead to changed behaviour and our future efforts will increasingly be geared toward achieving this goal,” said Cable. SANRAL’s programme fits into the Safe Systems approach advocated by the United Nations and South Africa is making a great contribution to the UN’s global Decade of Action on Road Safety, by sharing its research and experience in the field of education. At SANRAL, we are passionate about road safety. Every day millions of road users across South Africa travel on the road network that we manage. They commute in private cars, and public transport, such as taxis and buses. They share the roads, but they also share an expectation to complete their journeys in safety without becoming another statistic in the unacceptably high rate of crashes that occur on our roads each year. Across the world countries are moving toward the Safe Systems approach to achieve the vision of zero road fatalities or serious injuries. A key element of this approach is the recognition that humans make mistakes and that the transport system – ncludingthe road network – must recognise this and create forgiving environments. One of the most pressing issues facing South Africa today is road safety. The latest statistics show that about 23 people per 100 000 have lost their lives on the country’s roads in recent years. This has important consequences for our society. Not only does it result in an increased burden on social security and welfare systems, contribute to a loss of skills and add more costs to the economy, the greatest impact is on families, who have to cope with the loss of their loved ones – including breadwinners and children. 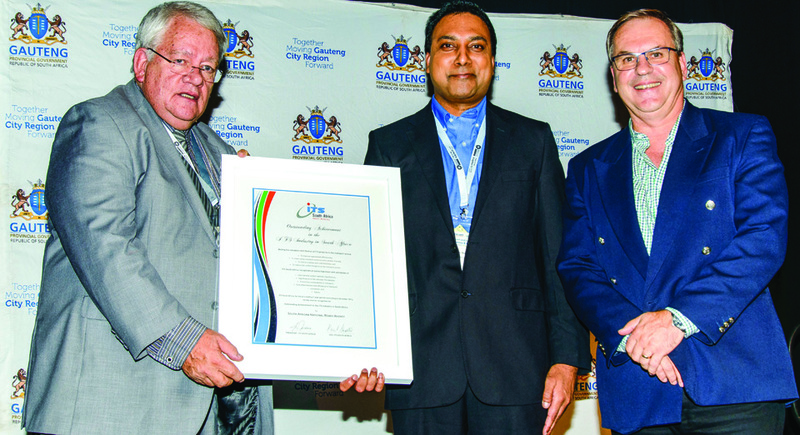 Kersen Naidoo (centre) receives award at the i-Transport and UATP Conference. The national roads agency’s use of cutting-edge technology to make South Africa’s roads safer is increasingly being noticed by industry experts. In mid-February, SANRAL received the Award for Excellence from the Intelligent Transport Society of South Africa (ITSSA). The award recognises the innovation behind SANRAL’s Intelligent Transport System project. The award was received on behalf of the agency by Kersen Naidoo, SANRAL’s Eastern Region ITS ProjectManager. The i-Transport and UATP Conference and Exhibition is a well-established event on the transport calendar. It serves as a platform for knowledge sharing and to promote the sustainable deployment of ITS projects. This year’s conference theme, Future of Public Transport: Go Green – Go Smart, reflects the need to improve transport efficiency, to reduce the carbon footprint of the transport sector and to encourage shifts to other modes of transport. This theme speaks to the relationship between public transport and intelligent transport systems, specifically. During 2015/16, the Gauteng Freeway Management System (FMS) facilitated the coordination of responses to more than 22 300 incidents, including 4 342 collisions. There was a 25% improvement in incident detection time, compared with 2014/15, and on average, incidents were detected within three minutes of their occurrence. This success was largely due to ongoing training, monthly incident debriefings of on-scene personnel and the refinement of standard operating procedures. SANRAL’s dedicated On Road Service (ORS) Unit – with 10 incident response vehicles, 10 lighttowing vehicles, eight heavy recovery units and six motorcycles for medical response – played a significant role in achieving more rapid response times. The ORS Unit responded to an average of 905 incidents per month. This figure represents an increase of 11% on the 2014/15 response rate. The KwaZulu-Natal FMS covers the busiest 120km of the N2 and N3 highways. Its traffic management centre dealt with approximately 12 000 traffic incidents, including 1 450 crashes in 2015/16. Stationary vehicles accounted for about 57% of incidents, while 15% related to traffic congestion and 12% were crashes. 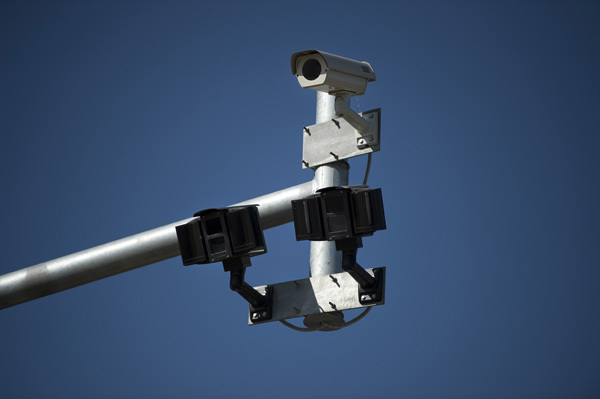 KwaZulu-Natal’s FMS comprises 144 cameras, 26 variable message signboards and 59 vehicle detector stations. All communicate via a high-speed fibre-optic system to a traffic management centre at the SANRAL offices in Pietermaritzburg. This system improves the safety of motorists through the speedy detection and verification of incidents. Emergency services can then be alerted and real-time warnings issued to road users. The average incident-detection time was two minutes, 25 seconds. During 2015/16, the Cape Town FMS facilitated a coordinated response to more than 20 000 incidents on the city’s freeways, including 2 400 collisions. The main success was sustaining the downward trend in incident-detection and crash-clearance times. On average, incidents were detected within two and-a-half minutes of occurring. A reduction in clearance times at fatal crash scenes was particularly significant. This can be attributed primarily to improved coordination among emergency services, including the South African Police Service. The Cape Town FMS comprises 237 CCTV cameras and 52 variable message signboards, which were available more than 98% of the time in 2015/16. To enhance the FMS, 79 vehicle detector stations (VDS) and 10 environmental sensor stations were commissioned. The Cape Town FMS contributes to a task team, set up to improve safety and security on portions of the N2 and R300. The primary objective is to improve safety and security, through proactive intelligence gathering and a rapid law enforcement response to any stationary vehicle on the highway. Most of us have experienced that critical moment on the road – that fleeting instance when you realise you have just missed being involved in a horrific crash. One second too soon and you would have careened into an oncoming vehicle. A split-second reaction too late and you might have overturnedyour car, going too fast around that wet bend. It is at times like this when you have to say to yourself: “Whoa! 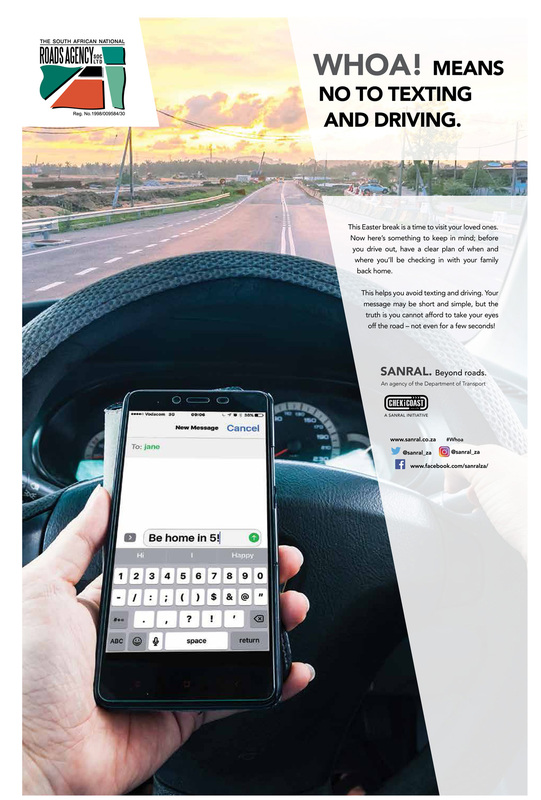 I should be making better decisions behind the wheel.” A fresh road safety campaign launched by SANRAL wants to avert those stomach-churning, heartthudding moments on the road, by encouraging drivers to say “Whoa!” earlier – when they still have control over the situation. Texting, checking social media and driving under the influence of alcohol or other mind-altering substances have caused far too many needless deaths on our country’s roads. Drivers need to change how seriously they take this negligent behaviour. Road users are encountering numerous messages that make them aware of the potential dangers that lurk on the roads and that encourage responsible behaviour. SANRAL’s campaign is intended to recreate those Whoa! moments and prompt a reaction. Launched during the December 2016 festive season, we wanted to reinforce the point that responsible road use by all motorists, passengers and pedestrians can reduce the number of collisions and save lives. WHOA! was launched with a series of TV and radio commercials across various stations, as well as print adverts, billboards, wall murals and social media interventions. Activations were held at pubs and shisanyamas, where messaging was aimed directly at the patrons. The campaign ran concurrently with another SANRAL road safety awareness initiative, CHEKiCOAST. The idea was to extend the reach and impact of ongoing campaigns and strengthen SANRAL’s continuing efforts to combat road fatalities. WHOA! will be carried through to other key holiday periods, when road safety communication is essential. CHEKiCOAST is a SANRAL awareness campaign. The initiative has developed into an important youth brand. It has a huge following on social media networks Facebook, Twitter and YouTube. It currently sits at 114 283 Facebook likes and 1 511 Twitter followers. Check out the CHEKiCOAST generation on Facebook (CHEK-iCOAST), on Twitter (@chekicoast) and on YouTube. SANRAL has initiated a number of programmes that seek to bring down the number of fatalities on our roads. The Department of Transport reports that South Africa is considered to be one of the worst performing countries when it comes to road safety, especially when it comes to crashes that result in death. Through the agency’s Road Safety pillar, one of its eight flagship pillar programmes, SANRAL is making a concerted effort to study human behaviour on the country’s roads. One such effort is the introduction of awareness programmes at schools that lie within 5km of a major road. Elna Fourie, SANRAL’s Development Planner, explains that the national roads agency is working together with universities and the Department of Basic Education to develop learning materials and introduce road safety awareness programmes at schools. “We want to influence attitudes towards road safety at an early stage. Our aim is to integrate road safety education into most school subjects, rather than treat it as a stand-alone issue to be addressed in only one subject. Road safety messages will thus be incorporated into subjects ranging from mathematics to life-orientation,” she said. SANRAL appointed the University of Pretoria to lead a three-year longitudinal study that has delivered major insights into the road safety knowledge and behaviour of learners. “We have a firm policy that every school within 5km of the SANRAL road network must be part of our education programme,” said Fourie. To augment the work it does in integrating road safety awareness programmes at schools, SANRAL has introduced a Safe Route to Schools project, designed to combine road safety education for school children, a teacher training package, road safety education and awareness and the introduction of safer road infrastructure on the routes to and from schools. 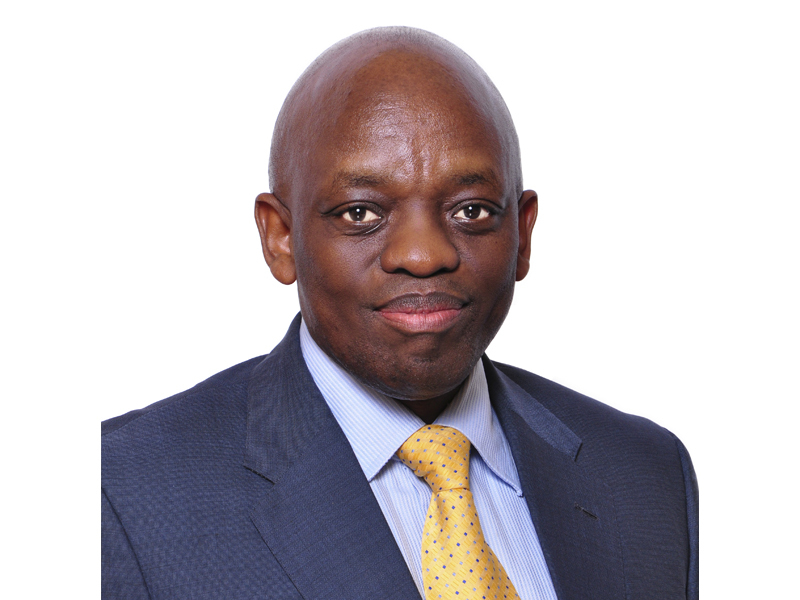 “SANRAL has identified schools across eThekwini and Ekurhuleni metros for this project. We have also involved other key stakeholders, such as the provincial government, the police and community representatives,” said Elna Fourie, SANRAL’s Development Planner. The National Department of Transport took to the provinces ahead of the Easter break in April to roll out its Easter Road Safety campaign. SANRAL, the Road Accident Fund, Road Traffic Management Corporation, Passenger Rail Agency South Africa, Road Traffic Infringement Agency and Cross-Border all took part in the campaign. It kicked off in Cape Town, where Deputy Minister of Transport Sinidisiwe Chikunga conducted road safety education discussions and took pains to point out that traffic law enforcement would deal with lawlessness on our roads harshly. 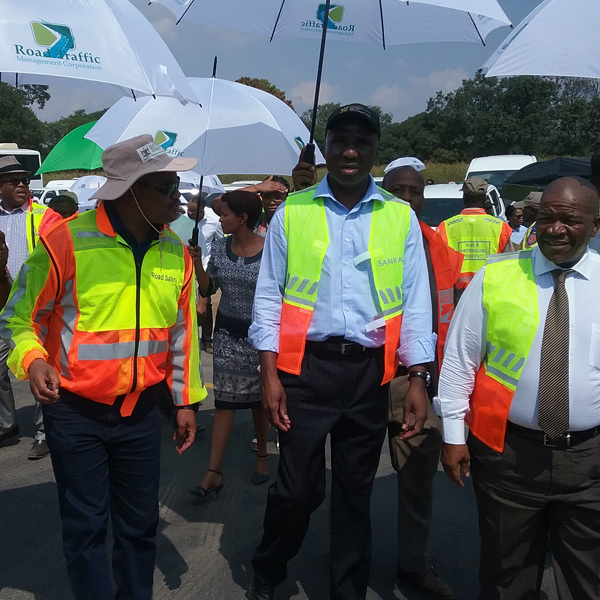 In Gauteng and the North West, newly appointed Minister of Transport Joe Maswanganyi took the lead in rolling out the campaign. For the North West leg, the minister, accompanied by MEC for community safety and transport Dr Mokgantshang Motlhabane, were joined by faithbased organisations. Prayer sessions were conducted at areas regarded as high-accident zones. In Gauteng, Minister Maswanganyi, Deputy Minister Chikunga, Gauteng MEC for roads and transport Ismail Vadi, MEC for community safety Sizakele Nkosi-Malobane and president of the South African National Taxi Council Phillip Taaibosch visited the Wanderers taxi rank in Johannesburg to engage the public. Taxi drivers and commuters had the opportunity to raise their concerns regarding the industry, especially in light of the cases of taxi-related sexual violence that has been in the spotlight recently. Minister Maswanganyi appealed to taxi drivers to help apprehend criminal elements and hand them over to the police. “Women should not be harassed. Let’s make sure that we respect women,” he said. He emphasised the importance of driving roadworthy vehicles and resting on long trips to avoid driver fatigue, which is a major cause of road incidents. “It is not possible for a normal human being to make three trips to Giyani in one day. It’ very dangerous and you will die and kill 14 other people with you. Your life is not worth the amount of money you are chasing. There’s nothing more traumatic for police officers than to break the news to a spouse or family member that they have lost a loved one. Please be safe.” The visits highlighted the Department’s vision of transport as the heartbeat of South Africa’s economic growth and social development. “The taxi industry is built by black people out of nothing and it continues to flourish despite the challenges,” Chikunga said. SANRAL will continue to pledge its support for the campaign and ensure that the road safety message is echoed to all citizens. On behalf of the organisation and the entire Transport Department, we wish you all wonderful and safe journeys. Don’t check, avoid the wreck! Every day of the week expert teams from SANRAL travel along every kilometre of the country’s primary road network, looking for any signs of pavement deterioration, especially potholes. It is, therefore, highly unlikely that a South African road user would encounter a gaping pothole on any of the 22 203km of road network managed by SANRAL. In the rare instances where they do start to develop, potholes are fixed within 48 hours. “We are keenly aware of the dangers that potholes pose to motorists travelling at cruising speeds on a freeway,” said Randall Cable, the Engineering Manager in SANRAL’s Western Region. Drivers who hit a pothole at speeds in excess of 100km/h can easily lose control of their vehicles and cause serious crashes. The SANRAL network has been divided into approximately 300km sections and teams move along it in one direction on alternate days, coming back on the same route the next. During these journeys, they conduct detailed inspections of the road surface, looking for the telltale signs of a developing pothole. This task becomes especially important after heavy downpours, when the water might have damaged the asphalt. The team also looks out for any other issue that might pose a hazard for road users, such as missing road signs or guardrails, debris left after a crash or a tyre burst and the occasional dead animal. “The quicker you can identify a safety risk, the quicker you can make the correct intervention,” said Cable. When SANRAL takes over the responsibility for a road previously managed by a province, the first step is always to start routine maintenance – clearing blocked storm-water pipes and culverts, cutting back vegetation, clearing litter and debris from the road reserves and fixing road signs and markings. Potholes found on secondary roads are the responsibility of provincial, district and local authorities. However, SANRAL does and is always willing to share its research, knowledge and expertise with such agencies as part of its broader efforts to promote all aspects of road safety in South Africa. Zethu Majola, 25, said the widening of the road and construction of the sidewalks made it safer for children to walk to and from school. “There has been a definite drop in crashes since the road was widened. We also have peace of mind knowing that our children are safe when they go school,” she said. SANRAL Eastern Region Project Manager Rajesh Dookie said the work undertaken between Murchison and the Marburg interchange involved constructing an additional two lanes to improve the capacity of the road, which carried high volumes of traffic, especially sugarcane and timber trucks. Also, the existing concrete sidewalks, which were 1.6m-wide along the entire road, were found to be inadequate due to the high volume of pedestrians. New 2.3m-wide sidewalks have been constructed, with guardrails to offer protection from the traffic. SANRAL continues to improve the safety of all road users with its projects along the N2 between Dutywa and Mthatha. One such improvement project stretches from the village of Tetyana to Sitebe Komkulu. It will take approximately 30 months to complete. It includes the construction of a pedestrian bridge and four agricultural underpasses, which would provide safer passage for both pedestrians and cattle, the upgrading of numerous intersections and the construction of access roads from villages to formal settlements. Nearly half of the deaths that occur on South African roads involve pedestrians and years of road-infrastructure disinvestment, along with the introduction of more road users, has made the former Transkei a region with a very high number of crash incidents. According to a statement by ( Former) Transport Minister Dipuo Peters on the preliminary festive season report for December 2015 and January 2016, fatalities in the Eastern Cape increased by roughly 22%, from 227 to 278. Controlled rock-cutting explosions will widen the road, smooth out the curves and improve sight distance – all major contributors to road safety. Controlled blasting takes place on Tuesdays and Thursdays, between Dutywa and Mthatha in the Ntentu cuttings. The road will be closed for a maximum period of two hours during blasting. Motorists travelling east, towards Mthatha, may consider either exiting the N2 at Ndabakazi on to the R408 towards Ngqamakwe/Tsomo, or via the R409 at Dutywa towards Ngcobo, as alternatives. Both routes link to the R61 and then rejoin the N2 in Mthatha. Motorists travelling west, towards East London, may consider using the R61 when leaving Mthatha and then linking back to the N2 via either the R408 after Ngcobo or the R409 towards Tsomo. The alternative route is 60km longer and may add approximately 40 minutes to your trip between East London and Mthatha. The R573, also known as Moloto Road, is a busy and essential economic route that connects three provinces: Gauteng, Mpumalanga and Limpopo. It is used by about 150 000 commuters every day, including buses, taxis and heavy vehicles. Consequently, road safety is a concern, especially as the road passes through rural communities, where there are many pedestrians. In 2015, the Department of Transport transferred the road to SANRAL for upgrading and R4.5bn was allocated for the project, over a three-year period. Part of the planning for safety includes the construction of traffic circles that will minimise conflicts at intersections and will provide a safer place for pedestrians to cross. Why roundabouts instead of traditional intersections? Former SANRAL Northern Region Manager Ismail Essa explained that traffic circles (roundabouts) have the advantage of reducing conflict points, calming traffic and most of the time, they compel traffic to reduce travel speed without bringing it to a stop. Planning is not yet complete, but all indications are that there will be more than 25 roundabouts in Mpumalanga alone. Six are envisaged for Limpopo; none in Gauteng at this stage. 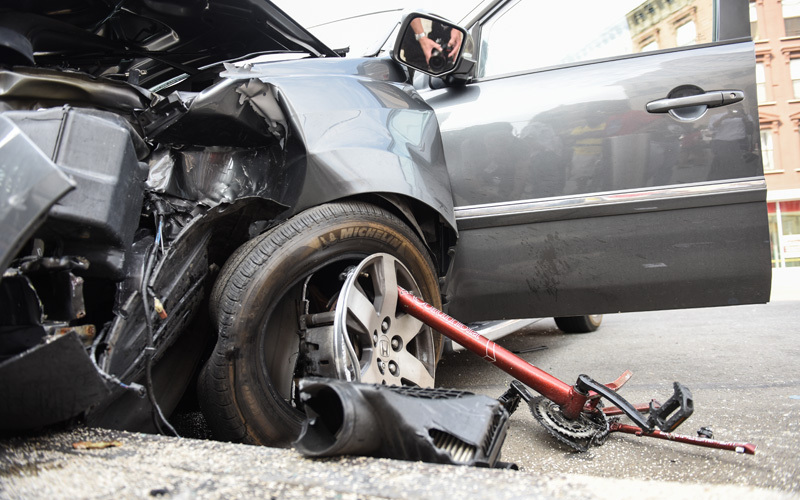 A traffic incident may warrant a response from emergency services such as ambulance, police, fire and traffic – particularly when lives are at risk. Non-emergency services, which include SANRAL, towing services, spill clean-up teams and specialist services, will focus on minimising the impact on and inconvenience to other road users by cleaning up and restoring the site to normal conditions as quickly as possible. The distances between towns in the Northern Cape are vast. Should an incident such as a truck losing its load occur and cause that road to be closed to traffic, commuters, businesses and other services are affected for long periods. While such an incident may not be lifethreatening, a delayed response time from emergency services, as well as the clean-up and road rehabilitation exercise, can have dire consequences for the treatment of patients and the local economy. The RIMS strategy makes provision for various levels of stakeholder engagement meetings that bring all emergency services together to resolve challenges caused by long road closures. Training, simulations and post-incident assessments are frequently done to improve the system and ensure fast detection and response. SANRAL remains steadfast in its commitment not only to design, finance, improve, manage and maintain the national road network as the country’s economic arteries, but also constantly to invest in technology and tools that improve the experience of road users, with incidents causing as little disruption as possible. Serious injuries and fatalities among children can be significantly reduced if appropriate car seats are installed in vehicles. However, good-quality child seats cost more than R1 200 and are too expensive for the average family. Bakwena N1N4 is working with a local charity to improve awareness about child safety in cars and to raise funds for families who can’t afford to buy the best car seats available. Peggy Mars, the founder of Wheel Well, said the Road Traffic Act requires that children under the age of three must sit in appropriate car seats, designed for the age and size of the toddler. Older children – up to 14 – must be strapped in with a seatbelt or sit in the back of a vehicle. “Car seats are designed to keep children safe during a crash,” said Charmaine van Wyk, Bakwena’s spokesperson. The company is supporting Wheel Well’s Car Seats for Kids campaign and has called on the public to make donations that will enable lessfortunate families to buy such seats. Another road safety partnership involving Bakwena is the Total Safety Cube Quiz. Eight primary schools from the North West recently took part in the final event at the Bapo Tribal Hall in Bapong, near Brits. The Road Safety Cube Programme is a global initiative to educate young learners through interactive sessions. Cubes containing workbooks, pieces of artificial roads and miniature road signs are given to Grade 4 learners and Bakwena is working with the North West department of education to help teachers develop learning material used in classrooms. Each learner also received a certificate, a reflective sticker for safe walking along roads and a set of colour pencils. Older children and teachers from 12 schools located close to the N1N4 highway received First Aid training, through a partnership with the SA Red Cross Society. Advanced training over five days is offered to youth and teachers who have successfully completed the initial stages. Assistance to crash victims, training of medical volunteers and specialised training for law enforcement officials are among the top road safety initiatives supported by N3 Toll Concession. The N3 is South Africa’s busiest freight route and carries up to 32 000 vehicles on the busiest days of the year. In addition to its regular patrols, monitoring of traffic and maintenance of the road surface, N3TC is especially concerned about the roadworthiness of heavy vehicles, which make up more than 30% of all movement between Gauteng and the KwaZulu- Natal coast. It offers specialised training to emergency services and law enforcement officials to spot dangerous tyres on heavy vehicles during inspections and also improve awareness about the transportation of dangerous goods on the highway. Training is conducted through Brake & Tyre Watch, an initiative of FleetWatch, South Africa’s leading online trucking magazine. Other road safety initiatives include Support for Community Medical Services, a group of volunteers based at Van Reenen at the top of the Drakensberg range. The team provides 24-hour medical response during peak traffic periods such as Easter and the December festive season. Then there’s Angels in Motion, a community network that assists accident victims and their families with immediate needs such as accommodation, access to medicine, car rental, vehicle repairs and pet care. N3TC also supports Mpofana – a public-private partnership with local law enforcement officials, to increase their visibility on the road and act against drunken driving. Travellers along the N4 near Waterval Boven in Mpumalanga might notice a diamond wire mesh covering cuttings on the road to prevent rocks from falling onto the road surface. This high-quality mesh is among the many interventions introduced by Trans African Concessions (TRAC) to protect the safety of road users and ensure they enjoy trouble-free journeys to their destinations. TRAC is responsible for the management of the N4 toll road from Gauteng into Mozambique. Near Waterval Boven, the road passes through a mountainous area where the rocks have become fragmented. The mesh is strategically placed at locations where rock fragments could become dislodged. Elsewhere on the route, ultra-strong wire ropes have replaced guard rails on the side of the road to improve safety and milled rumble strips placed in the centre to warn drivers against crossing into oncoming lanes. TRAC is considered a leader in road engineering and has introduced different types of road surfaces to improve the skid-resistance of vehicles in wet weather. Special fluorescent materials are used on signage such as curve markers to ensure better visibility for drivers. Traffic calming measures were also introduced at several spots along the 570km route managed by TRAC. These include prominently placed road signs, top-quality cat’s eyes that reflect lanes and borders and rumble strips close to areas with high pedestrian activity.